Situated on the outskirts of the market town of Newton Abbot, this Redrow `Worcester` home from the Heritage Collection was built in 2015 and is presented in show home condition. With many extra`s, the current vendors have landscaped the rear gardens and have enhanced the kitchen with decorative tiling and a lovely range of units. 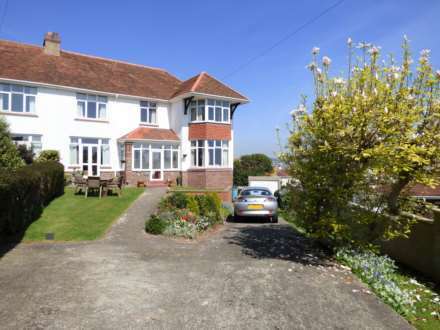 The accommodation is both spacious and `family friendly` with a wonderful kitchen dining room with sliding double doors opening onto the garden, a cosy lounge with a bay window, utility room and WC. On the first floor there are three double bedrooms, all with fitted wardrobes with the master enjoying a ensuite shower room and bedroom two benefiting from a dressing room. The spacious family bathroom has been very well appointed and the whole property really captures a traditional build style combined with modern, up to date living. Externally, the front garden is laid to level lawn with driveway parking for two cars leading to an integral garage, with power and lighting whilst the rear garden has been skillfully landscaped and offers a level patio, ideal for alfresco dining, level lawn and lovingly maintained flower beds with seasonal planting. There is also a useful timber shed, water tap and outside lighting. There is also the added benefit of the remainder of the NHBC. Newton Abbot itself is a bustling market town with excellent transport links, both by rail and road with a mainline train station and links to Plymouth, Exeter, Torbay and the M5 network. With excellent amenities, shops, high street, super stores and schooling, Newton Abbot is also perfectly placed for the outdoor lovers with Dartmoor National Park and the beautiful south Devon coastline both within easy striking distance. Obscure double glazed window to the side, extractor fan. Low level flush WC, corner wash hand basin with mixer tap above and tiled surround. Amtico vinyl flooring and radiator. Double glazed feature bay window to the front aspect, radiator, television and satellite aerial point. Recess spotlights, extractor fan, obscure double glazed window to the side. Low level flush WC with semi pedestal wash hand basin with vanity mirror above and shave point. Walk in double shower cubicle with tiled surround and mixer shower. Chrome effect ladder style heated towel rail and Amtico vinyl flooring. Double glazed window to the rear aspect, range of built in wardrobes and radiator. Useful walk in dressing room/storage cupboard. Double glazed window to the rear aspect, range of built in wardrobes and radiator. Obscure double glazed leaded window to the front. Built in airing cupboard housing the immersion hot water tank and mega flow unit. Range of matching white suite comprising of a low level flush WC, semi pedestal wash hand basin with mixer tap above and vanity mirror and shaver point. Panel bath with tiled surround, corner fill mixer tap and mixer shower above with glass shower screen. Extractor fan, chrome effect, ladder style heated towel and Amtico vinyl flooring. To the front of the property there is a level drive offering parking for two vehicles. The front garden is primarily laid to level lawn with flower beds and seasonal planting. Metal up and over door accessing the INTEGRAL GARAGE with power and lighting and a wall mounted gas fired central heating boiler. Gated access to the side leading to the rear garden. The rear garden is a real delight and has been landscaped by the current owners and enjoys a southerly aspect and is enclosed by fencing. There is a level patio, ideal for alfresco dining with the remainder of the garden laid to level lawn. Gravel and slate chipping path and well maintained and planted flower bed and boarder. Timber shed, vegetable garden, water tap and outside light.